When you work in the food service industry, having a good pair of kitchen shoes can be invaluable. You’re going to want special shoes that make working in environments with grease, water, and oil easier, as well as being more comfortable overall. We’ve compiled this list of the best kitchen shoes for food service professionals. Before we start looking at them, here are some things you should know about kitchen shoes specifically. Upper Material: What material is the upper portion of the shoe made of? The leather is the most popular material because it’s water resistant, but EVA foam is also fairly common in kitchen shoes. Sometimes they are even made of rubber! 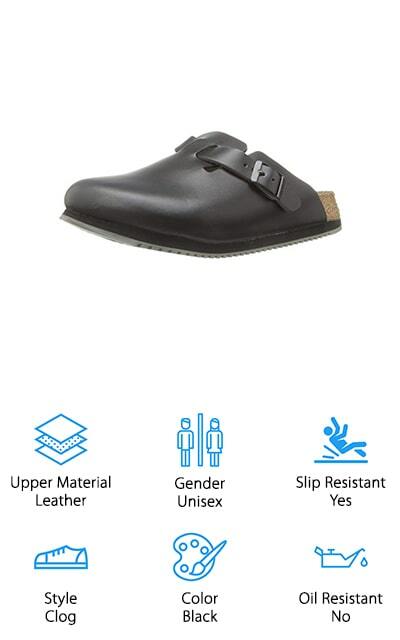 Gender: What gender are these shoes made for? Make sure that you’re getting the perfect size by checking the size conversion charts if you’re ordering men’s shoes for a woman and vice versa. You want a great fitting shoe! Slip Resistant: Are the shoes slip-resistant? Shoes that are made for use in kitchen environments usually are, but we’ve put the information here just in case. You’ll want to be able to move through your kitchen confidently and without slipping. Style: There are a few different styles represented on our list, including slip-on shoes that you simply insert your foot into. There are also clogs, which are a little more breathable, and some lace-up shoes which tie onto your feet. Color: What color is the shoe? Sometimes they come in multiple colors, and we’ll let you know which in the description. Most food service shoes are black for uniformity but choose according to your own preference and requirement. Oil Resistant: Is the shoe resistant to oil? Sometimes oil can ruin shoes, or send you slipping around long after you’ve left an oily environment. If you work somewhere this might be helpful, watch out for oil-resistant shoes. Now that you have all of this information to work with, we can show you the top kitchen shoes that we could find in our research. We’ve made sure that each of these shoes is perfect for work in the food service industry. The top pick and budget pick are our personal favorites, so try those on for size before moving through the rest of our list. We’re sure that you’ll find a perfect, comfortable shoe for your kitchen! Our top pick for good kitchen shoes comes in the form of these Birkenstock clogs. The uppers are made of 100% leather, which is comfortable and breathable while still being water-resistant. They are certified slip resistant, so you can wear them in the greasiest of environments and still get traction. The sole is completely synthetic, with a cork footbed that is comfortable to walk around in all day. It supports all of your arches and molds to the shape of your foot for a customized support level that will help to distribute your body weight across the length of your foot. All of this combines to make a super comfortable fit that won’t have you slipping all over the kitchen. The strap and buckle add to your comfort level, so it’s perfect for every foot. Plus, they are unisex so both men and women can wear them comfortably. You’re going to regret not purchasing these shoes sooner. 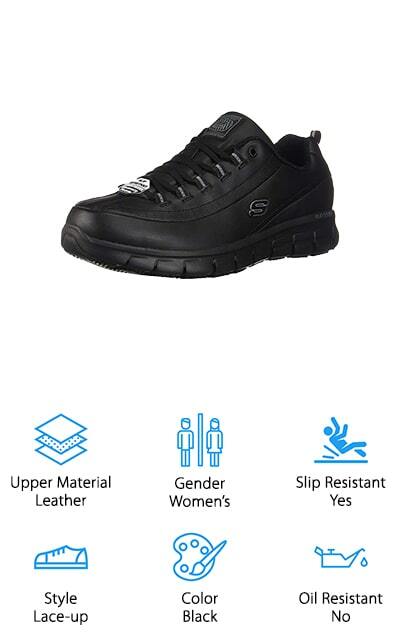 Skechers makes these non-skid kitchen shoes that are great for work. They lace up so you have a secure fit when you’re in a fast-paced job. While these shoes are rugged, they also feature perforated mesh panels on the sides of the shoes, as well as removable insoles that are made with memory foam to help support your feet during those long days. The uppers are made of high-quality leather that is going to be super comfortable on your feet. The sole helps to absorb shock so your feet are more comfortable overall. The heel is about 1.5 inches. These shoes are made for women, and they feature a super casual design that will fit in with your food industry uniform perfectly. 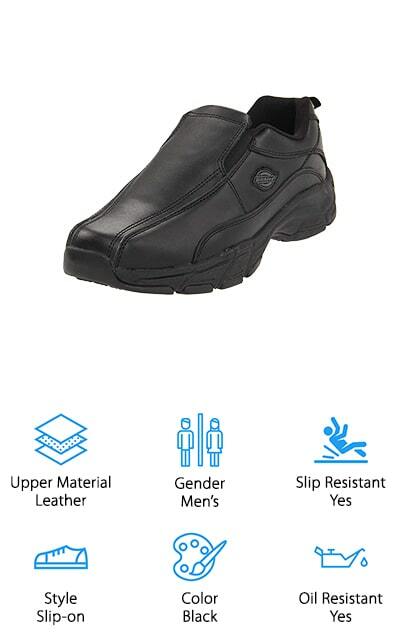 The rubber sole makes these shoes stable and slip resistant for even the most slippery work environments. They’re going to fit well, keep your feet cool, and they’re cute kitchen shoes as well! These shoes by MerrellEncore are made for men, and they’re really supportive kitchen shoes. They have a supportive sole and a padded collar so that those long days are a little bit easier. The air cushion in the heel helps absorb shock as you’re walking around, and the frame is made of compression-molded EVA foam for increased stability and a comfortable fit. The sticky rubber outside of the shoe helps you keep moving even in slippery conditions and helps to reduce fatigue in your feet and legs after walking around all day. The sole is a GRIP model, so it’s slip resistant and will help you retain traction while staying perfectly comfortable. These full-grain leather shoes are the perfect restaurant kitchen shoes, and you certainly won’t regret putting them on in the morning. They are styled casually so they go with your uniform, while also being comfortable enough to keep you going. You’re going to love them! KEEN makes these utility work shoes that will make you work that much more efficiently in food surface. They rival Bragard kitchen shoes for quality and popularity. That’s because they are completely slip-resistant and oil-resistant, with a rubber sole that will help improve traction and help to absorb the shock as your rush around filling orders. It includes KEEN’s infamous toe protection, which means that the outsole wraps up and over the toes so that they are even more protected. You won’t be slipping on oil or grease, and the leather on the outside is waterproof as well. The footbeds on these shoes are made of polyurethane, cork, and memory foam in a blend that makes it feel as though you’re walking on a cloud, and adjusts throughout the day to conform to the special shape of your foot. The EVA midsole is compression molded for even more comfort! These shoes will keep you going all day! These clog-style shoes by SensFoot are made with an EVA upper that’s comfortable and extremely lightweight. There are side vents and removable straps, all on top of breathable insoles that are meant to keep your foot dry and comfortable all day long, even when you’re under the most stress. The EVA foam makes it easy to move around because these shoes weigh less than 0.6 pounds each. 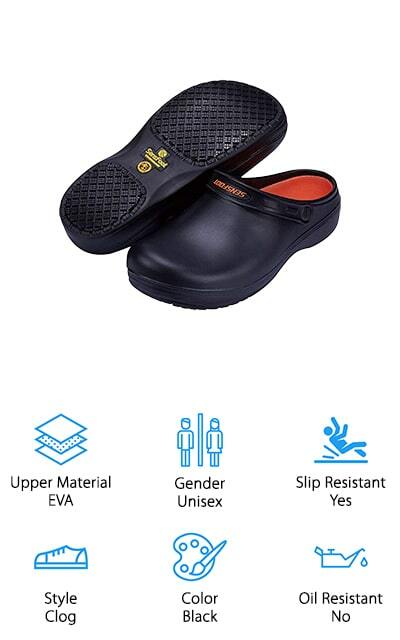 Plus, the rubber sole meets the highest slip-resistant criteria, meaning that you’ll stay on your feet no matter how slippery your work surface is. It’s specifically made for chefs and food service workers. The use of EVA also makes them vegan kitchen shoes, because no animal products are used to make them. These shoes are environmentally friendly so you can rest assured that your foot comfort also eases your mind. These shoes will be your constant companion through long days on the job in your restaurant or kitchen. Emeril Lagasse is a celebrity chef, so chances are he knows a few things about shoes that work well for food service. They are made of leather with a completely slip- and oil-resistant synthetic sole. The outsole provides traction on wet surfaces as well as on grease, so you’ll be able to stride confidently through your kitchen without slipping around. The midsole is made of molded EVA foam for superior comfort and support for your arches, as well as a memory foam insole that will give you comfort all through your long days. These shoes slip right onto your feet without laces or buckles, so you’re going to need a tight fit to reduce blisters. These shoes focus on stability and all-around comfort, no matter how long you’re in a fast-paced kitchen environment. Emeril Lagasse has made sure that these shoes are going to be the best you’ll find for food service, and we’re sure that you will agree! 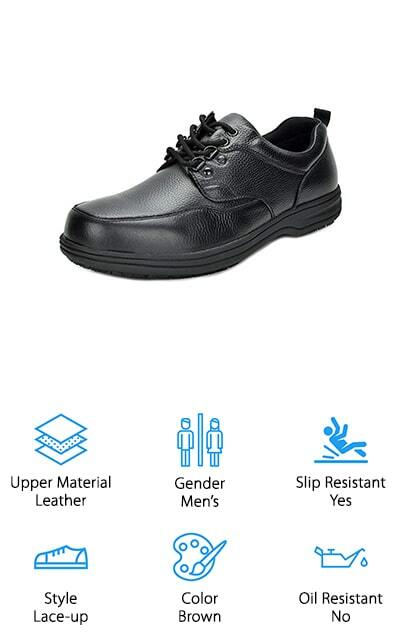 Dickies’ Athletic Work Shoes for men are slip resistant, oil resistant, and slip right onto your feet without troublesome laces getting in the way. You’ll never have to stop working to tie your shoes with these! They are comparable to Reebok kitchen shoes in every way, even down to the leather upper and completely rubber sole. The elastic side gores help to keep your feet comfortable while you move around, and they add a level of moisture-wicking to help keep your feet dry as well. The fabric lining on the inside of the shoe will make sure that you’re comfortable all day long, especially when combined with the padded tongue and collar. The midsole is made of lightweight EVA foam that will help support your arches and keep your feet comfortable even after long days, and the outsole channels liquid away from your foot. You’re going to love these shoes and wonder how you worked without them! These unisex chef clogs by Fanture are perfectly comfortable and feature an EVA upper. 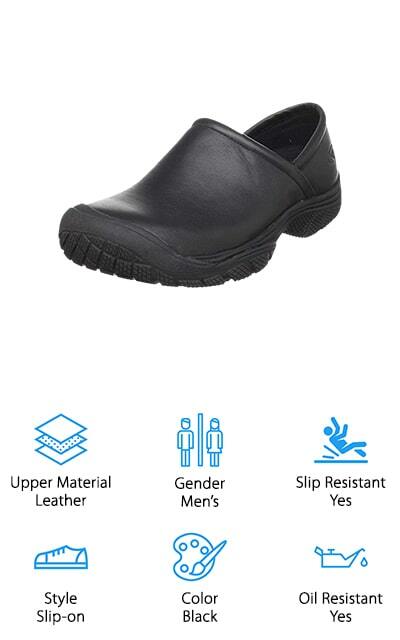 This makes them lightweight and comfortable; great for when you’re working on the food service floor or in a hospital or health care environment. These shoes will work either way! They have a slip-resistant sole that is completely made of rubber so that you won’t slip around even the greasiest workspaces. They are resistant to oil as well, so you’ll stay standing no matter what. The insole is comfortable and breathable, with a footbed that helps to keep your foot dry no matter how much you sweat. They are great for all different occasions – you can wear them in your garden as well as in the workplace. We love how multi-purpose they are, and they’re so comfortable you won’t want to take them off anyway! They even have a sturdy toe cap, made of extra-dense EVA so that your toes are protected. VANGELO makes these amazing unisex chef shoes. They are super lightweight, and comfortable, and come in lime green and white varieties as well as the standard uniform black. The EVA foam makes these shoes easy to move around in, even when you’ve had a long day. They’ll never feel heavy! They are supportive and comfortable and include an Ortholite insole that you can take out if you have your own favorite. The shape on the outsole is meant to channel liquid out from under your foot, increasing traction and helping to keep you on your feet. 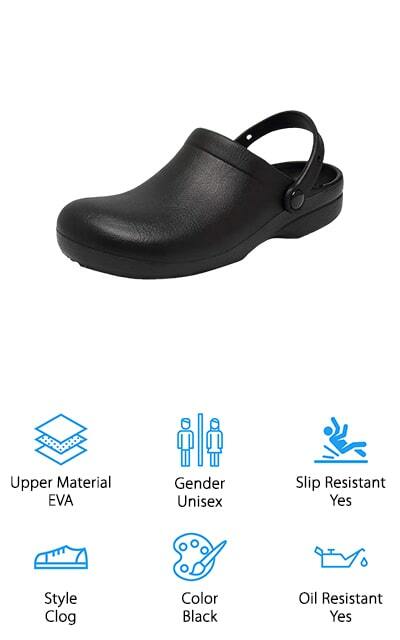 These shoes are great for nurses as well as for chefs and food service workers, and you can get them in either men or women’s sizes. 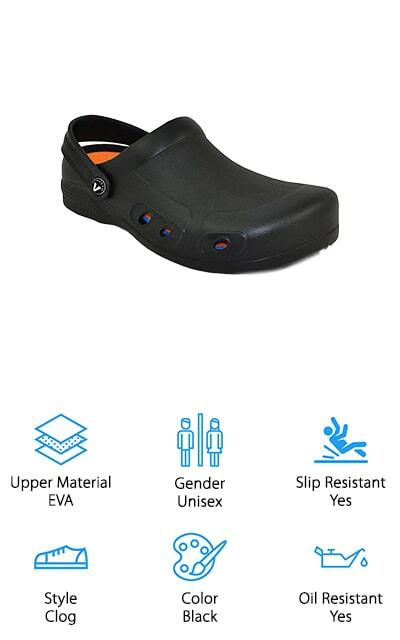 The rubber soles help to absorb shock as you’re moving around, which is helpful in any of the industries that will be made more comfortable by wearing these shoes. The surface is even antimicrobial for washing. DREAM PAIRS makes these super-stylish men’s work shoes that look exactly like business oxfords. If you want the perfect blend of professional look with a casual feel, these shoes are definitely for you. They have a rounded-toe design that makes sure your toes won’t rub against the upper, which is made of genuine leather for a great look and feel. They are comparable in comfort to Dansko Men’s kitchen shoes, so you know that you’re going to feel great wearing them to work. There are several different colors to choose from (variations of black and brown), so you can look great and reap the comfortable reward that these shoes offer. Even after being on your feet all day, your feet are going to feel much better with these shoes. Our favorite part of these shoes is the comfort they offer, while still looking like snazzy Oxfords at the end of the day. No one can tell the difference!